The Toadwood Forest is a spooky forest located in the Mushroom Kingdom. Monsters such as Koopeleons, Boo Guys, and Elasto-Piranhas reside in the forest. 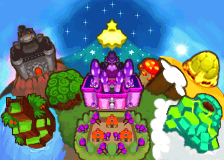 During the events of Mario & Luigi: Partners in Time, the four Mario Bros. (Mario, Luigi, Baby Mario, and Baby Luigi) traveled to the Toadwood Forest of the past in their effort to locate shards of the Cobalt Star. However, instead of finding a piece of the Cobalt Star, the brothers discovered the bodies of lifeless Toads strapped to the forest's trees. The Shroobs had genetically-engineered the trees in the forest. During the Shroob invasion, Toads would be abducted and placed in these trees. The trees would then proceed to drain the vim, the Toads' life force, out of them, slowly killing them in the process. The vim was then transferred through the roots of the trees to the Vim Factory, a huge Shroob-created building built in the middle of the Toadwood Forest. Once there, the vim would be altered with chemicals and be used as fuel for the Shroob UFOs. As the four Mario brothers journey through the forest, they encountered multiple Toads strapped to the trees. Some of the Toads are can be talked to. One Toad, Toadiko, revealed the Shroobs' plans to the Mario brothers. Unfortunately, Toadiko was caught and turned into a Shroob Mushroom by the Shroobs. However, the Mario Bros. managed to escape the Shroobs. Eventually, the Mario brothers discovered the factory in the heart of Toadwood Forest, unlocked the front door, and proceeded inside of it. The Mario brothers also investigated the many hollow tree stumps found throughout Toadwood Forest. 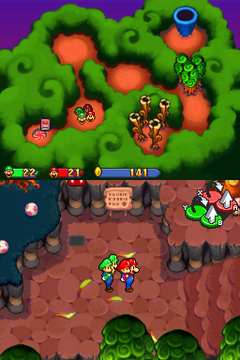 To enter these tree stumps, Mario and Luigi had to throw Baby Mario and Baby Luigi over their heads and into the stumps. Usually, the baby Mario brothers would find coins, mushrooms, and even badges. However, sometimes there were enemies inside and they would engage the babies in battle. Mushroom Two are in the ? Block in the southeast of the second scene in the first area. In the right ? Block in the west trunk of the northwest scene in the second area. Super Mushroom In the left ? Block in the trunk in the third scene in the first area. Mushroom Drop In the right red block in the south trunk of the second scene in the first area. 1-Up Mushroom In the green block in the southwest of the fifth scene in the first area. In the left green block in the northwest corner of the northwest scene in the second area. 1-Up Super In the red block above the east yellow platform in the southwest scene in the second area. Green Shell Three are in the right ? Block in the northeast trunk in the fourth scene in the first area. Two are in the left ? Block in the west tree trunk of the northeast scene in the second area. Two are in the right ? Block on the east platform of the southwest scene in the second area. Bro Flower Six are in the red block near the entrance of the second scene in the first area. Six are in the green block near the entrance of the fourth scene in the first area. Three are in the ? Block at the center of the fourth scene in the first area. Three are in the ? Block above the east platform of the northeast scene in the second area. In the ? Block above the northeast platform in the south of the southwest scene in the second area. Unarmed Jeans In the right red block in the west trunk of the south scene in the second area. Wallet Badge In the green block in the north of the southeast scene in the second area. Wild Trousers In the green block above the northwest platform in the south of the southwest scene in the second area. Bean Near the entrance of the final scene in the first area. To the right of the pipe in the first scene in the first area. To the southwest of the pipe in the entrance scene of the second area. To the northeast of the pipe in the entrance scene of the second area. This page was last edited on October 9, 2018, at 07:02.